If you are having suicidal thoughts, know that you’re not alone. According to CDC, an estimated 9.3 million adults (3.9% of the adult U.S. population) report having suicidal thoughts in the past year. These types of thoughts develop for a number of reasons. This type of thinking may arise out of depression, or mental illness. It could be situational like a job loss, that has created financial hardships. It could be from the loss of a family member or friend or it could be the result of long-term thought patterns that seem to have no solutions. Everyone has had suicidal thoughts at one point or another. However, when they are recurrent and involve a plan or a method of hurting oneself, they need to be addressed. No matter what the reason for suicidal thoughts, it is important to understand that they are a temporary reaction to a situation or problem. Problems can be solved. Situations change. What seems impossible today, will usually look different in the morning. Talk to someone you trust- You may feel embarrassed to tell someone, but they will not judge you. If you don’t feel comfortable telling someone you know, talk to someone who is trained to help people who are struggling with these types of thoughts. You could start by calling the suicide hotline 1-800-273-TALK or reach out to a psychologist. Using treatments such as cognitive behavior therapy can help you understand where the thoughts are coming from, so you can better understand what triggered the thoughts to come. Create a safe environment– One of the most important things you can do if you have these thoughts is take away anything in your environment that may bring harm to you. If you do not feel strong enough to take this step, enlist someone else to help you. Tell the person you do not feel safe having the weapons or substances around at this time. Talk back to the thoughts. One important thing to remember is that you are not your thoughts, you are not your feelings. Get out a piece of paper or the note app on your phone and try creating coping statements. Think about the people who love you- If you really sit down and think, there are several people in your life who love and support you. It could be a close family member or a friend. If you don’t feel loved and supported presently, think about a time when you did. If you are able to, call that person and tell them you are having a hard time and you need some encouragement. Remember that saying you need help is not a sign of weakness but a sign a maturity and strength. Make a list- Make a list of all the things in your life you are thankful for. Try to get your mind off the thoughts that make you feel helpless. Make a list of all of the things about yourself that you like. Make a list of the things you want to accomplish, hobbies you like and people who you have helped or helped you. You’re here on this earth for a purpose. Try to connect your thoughts to understand how important you really are. Reminisce- Think about all the things that happened in your life that have brought you joy. Tell yourself “the best is yet to come” Think about the things you used to like to do and make time to do those things. Take a walk- Call someone to take a walk with you and get out in nature to appreciate the simpler things in life. Go for a hike, get in the sun and get some exercise. If the weather is bad, run in place for 20 minutes. Or do 50 pushups. Get spiritual/meditate- Escape from the stress in life that you feel by practicing yoga or meditation. Try to connect with something that is greater than you. Listen to quiet music and let your mind rest. Read, watch or listen to something encouraging. Go get connected with people or animals. You do not need to talk if you do not want to. Just go into the Starbucks and grab a coffee or go to the Mall and walk around. Or go to the animal shelter or the pet store. Visit your local zoo. Just being out in contact with others is helpful in shifting your mood. Know that what you’re feeling is temporary. What you’re feeling is not always reality and if you’re patient and take the needed steps, what you feel will most likely go away. Even though things don’t always go according to plan, there’s always a way to get through the obstacles life brings. 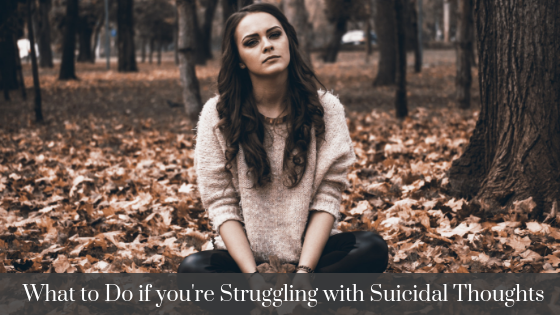 If you continue to feel suicidal for more than a few hours, be sure to contact a psychologist or other healthcare professional. You can feel better. You just need to have some help right now. ← How Can You Tell if You’re Depressed or Just Sad?